Have a 4000km trip planned to August & want to protect against chips etc but don't like protective films - Has anyone tried this product? - just released in Oz - All the blurb looks ok but proper testimonials are the best. "Be Thankful We're Not Getting All The Government We're Paying For"
Looks like liquid Saran wrap, also looks like it works well too. Any idea of the cost? and is it available outside of Oz? Guess I'll be the trail blazer & order some. Video's very cool! Never seen a woman take a bra off like that. I can see some real applications for that product, great for long road trips! Keep us posted. Like it. The road warrior comes from the bottle as a thick white liquid - the roller is good quality & applied the liquid reasonably good - a paint brush took care of the hard to reach areas the roller couldn't reach. Good pic of the product on the front guard - this was the 2nd coat - the heat gun worked a treat in making it goes off & reasonably clear. The black on the batwing absorbed the sun & heated up nicely - the Road Warrior was curing almost immediately on application - 1/2 way through the 2nd coat - I applied a 3rd coat as I wanted extra protection for my trip. 3 coats & dried to a reasonable looking finish - the photo shows the matt effect of the coating on the black - it looks almost transparent on the orange. THe Road Warrior shows up noticeably on chrome as I expected - but protection I wanted - that I got. There she is all completed - around 2 hours work - the look is acceptable but the product shows noticeably on black paintwork with a matt sheen - the texture feels like a hard plastic & seems quite a hard quality protective finish - all leading edges facing forward - batwing/ lowers/ forks/ front of tank/ front & top of panniers all done. I feel the bike is nicely protected & is now ready for my 4000km pilgrimage. I also put some on another place to test the makers claim of wetting it & peeling it off - it did so perfectly. I'll post some more pics post trip of how the product weathered & ease of removal. At this early stage I'd definitely recommend Road Warrior for folk like me sweating on damaging paint on a long trip. Anxious to hear how it worked and how easily it comes off. Will be back on Aug 30th from my 4000km trip & will definitely post a detailed report - am also keen to see how it stands up to the elements - so far so good. Well the trip is completed - 4000 fantastic kms - can't wait to get underway again on my next road trip - now how did the Road Warrior hold up? The pics as below should tell the story. Bike was filthy with bugs, road grime & the innards of a few wayward birds that committed suicide. The Road Warrior film peeled off very easily - if you like me have a wife who loves peeling sunburnt skin off your back - this could be a job for her? Lets now have a look at the saddle bag tops - so glad I applied the Road Warrior to these surfaces as I'm sure on a long road trip they'd be scratched to my horror! A shot of the Road Warrior film - fairly transparent but very bloody tough - those saddle bags are as good as new! In summary - is the Road Warrior worth it? ?……in my opinion yes - it provided a decent barrier against all manor of flying bugs & road grime, small stones etc - Took about 2 hours to apply & cure & about 15 minutes to remove as part of washing the bike. 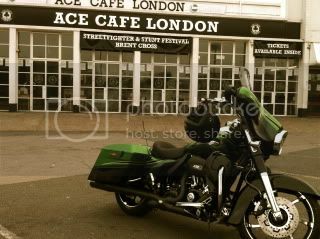 Any negatives - The bikes appearance is definitely eroded with the Road Warrior applied - the barrier has a semi sheen look which takes all the gloss from the paint - a number of folk asked me during my travels why did the paint look so crap! - Also when riding through heavy rain, water created blisters under the Road Warrior - I popped them during my fuel stops & as the weather got warmer - the Road Warrior re cured to a hard finish once again - in rain the product washed off all the chrome parts it was applied to. Would I use again? absobloodylutely! - I feel this product is a worthy addition to all those who value no paint damage over bling on a long distance trip. I can even see a use for this on the leading edges of my car on longer trips - no more stone chips or bug residue. Hope you enjoyed my review - I for one will be buying a 2nd bottle in case this product is discontinued in the future. Hey Glen, thanks for the full report. Looks like a very good product to use.